The nose starts off with delicate cinnamon spice, covered by sherry flavours and dark dried fruits. Barley sugar, sweet honey and custard with a hint of leather in the background. Bold and rich on the palate with a massive load of sherry, layers of dried fruits, raisins and subtle sweet acacia honey. This is complemented by a nicely warming spiciness of cinnamon, Xmas spice, oak and a hint of pepper. Underneath there's a lovely sweetness of barley sugar, vanilla and lingering nutty flavours. Deliciously mouthfilling! The finish is long, pleasantly warming and fruity with raisins, followed by a delicate nuttiness and prickling oak. Becomes drier towards the end with spiced oak and slightly bitter dark chocolate. 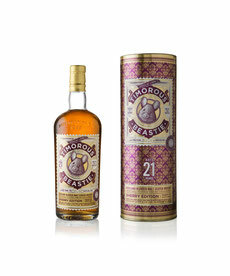 This limited edition of Timorous Beastie is a big, bold and intense blended malt with a great mouthfeel. Full of rich sherry flavours, dried fruits and sweetness, perfectly balanced with oak and Christmas spices. Certainly one for the upcoming Xmas season. Best to enjoy neat in front of a log fire.